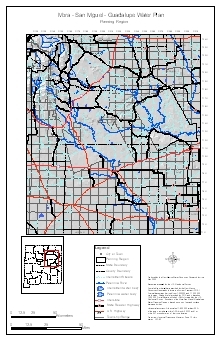 Shows the location of agricultural lands, including cropland, pastures, orchards, groves, vineyards, and nurseries in the planning region. A thematic map showing the ownership of major areas in the Mora-San Miguel Water Planning area. This includes divisions such as private land and government held land (the forest service, military bases, Indian reservations, Bureau of Land Management land, and so forth). A thematic map showing the elevation of the water level (in feet) at well points throughout the planning region. 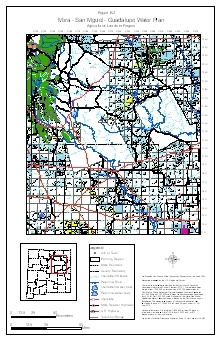 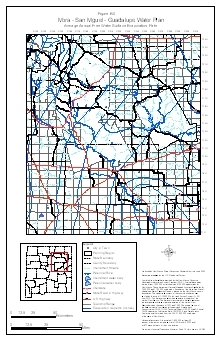 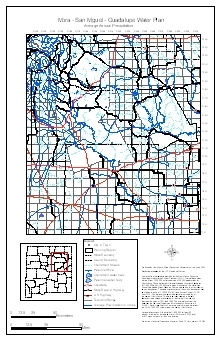 A thematic map showing the depth to groundwater at various well sites throughout the planning region. 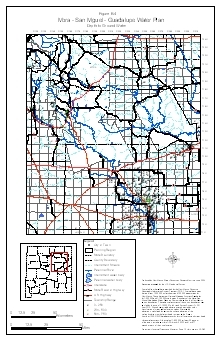 Shows evaporation level (in inches) using contour lines. A thematic map showing the nitrate levels at wells throughout the planning region (in milligrams per liter).